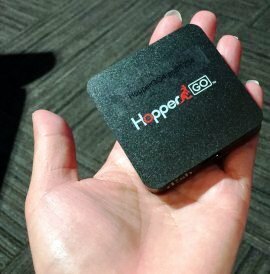 DISH Network launched HopperGO Super portable mini device for TV on the go. In January, DISH Network has made a big splash with the news that the company will soon launch its latest and greatest DVR, the hopper 3 and later they made another announcement that DISH will also a mini hard drive, also known as HopperGO. This mini device for TV is now officially available. With HopperGO, you can take up to 100 hours of programming in the pocket. At 2.5 by 2.5 by 0.5 inches, it's small enough to fit in your hand luggage or backpack, and any pocket. Its weight is 2.5 ounces, so it is very easy to carry. It is also very easy to use. Just connect the HopperGO to one of the USB ports on the DVR of Hopper 2 or Hopper 3. In this way, you can transfer recordings and charge the internal battery. HopperGO also promises in operation to four hours of playback. To use HopperGO, you just need a DISH anywhere app. This is the place to start to transfer, access records and to delete the contents of your little hard drive. To move the content to the HopperGO, log on the DISH everywhere app and go to your DVR. Click on a program, press transfer and select Transfer to HopperGO. An important note is that DISH subscribers can transfer only registered recordings. This means that there is no on-demand rental. Even the playlists from your library anytime Primetime must be stored on the DVR hard drive before you can move them. If you copy something to HopperGO, content is condensed for portable use. However, this process is fairly painless. Transfer of a comedy show of 30 minutes took 90 seconds and 124 minutes Ant-Man lasted in just 3.5 minutes. Once you have finished the transfer of content, you can unplug your device from the DVR. We should also mention that it is not necessary to keep the original program in the hopper DVR,you can delete that and can view later with HopperGO but knowing that the original copy on your DVR remains until you delete them. As already mentioned, all are in the Hopp Ergo can be viewed with DISH Anywhere App, which is free for iOS, Android, and Kindle. Before you begin, you need to connect with HopperGO, which creates its own private Wireless cloud. You can do this by connecting to the configuration of the wireless mobile device in transition to HopperGO as Wi-Fi network, and enter the password, which is at the bottom of HopperGO. Up to five mobile devices can be connected simultaneously. While connected HopperGO is very easy to use. If you like to access the content through the application of DISH everywhere, you will love the HopperGO. It streams the content much clearer without interruption. Moreover, no data plan from your mobile device is used. And although some of the features of the Hopper such as AutoHop are not available here, making the HopperGO easier to navigate it without buffering problems caused by the contents. If you love to watch TV everywhere, DISH Network HopperGO is definitely a fun way to do it. It allows you to take the content that you want to take - a lot of it. It also makes the process a little easier to see an experience quite smooth and brings your TV and content everywhere. At $99, it is also quite affordable. When you subscribe to DISH, you can buy HopperGO today by phone or visit your nearest dealer. No technology visit is required!